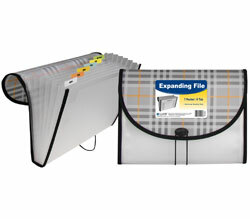 Zippered expanding file lets you safely store and transport papers. Zippered expanding file lets you safely store and transport papers. Translucent acid-free polypropylene provides visibility and document protection. Great for leave-behinds and presentations. Easy-slide zipper keeps your materials safe. Oversized front pocket to hold a cover sheet or routing slip. Heavyweight material. Holds up to 200, 8 1/2 x 11 documents. Clear. Hi, I'm Cheryl with C-Line, and today we're going to talk about our Reusable Envelopes with an Outer Pocket. C-Line Zip 'N Go™ Reusable Envelopes are made from acid-free polypropylene and are perfect for storing and transporting your letter-size documents. These Reusable Envelopes have a clear front and back, which makes it easy to view the contents. There is also an extra pocket on the outside with a tuck-in flap to hold even more information like a cover sheet or a daily schedule. The envelopes load from the long side, and the easy-zip closure keeps your documents safe and secure. Each envelope stores up to 200, 8-1/2 x 11 sheets. Reusable Envelopes are excellent for interoffice communications and for storing your school projects, reports, paperwork and more. They are great for organizing your home, school and business. Order yours now! That's all we have for today. I'm Cheryl with C-Line. Thanks for watching.